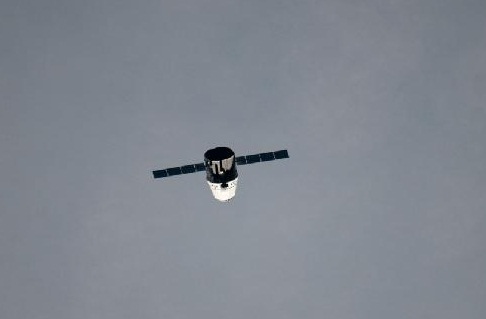 The SpaceX Dragon commercial cargo craft approaches the International Space Station on May 24, 2012 for a series of tests to clear it for its final rendezvous and grapple on May 25 (Credits: NASA). The SpaceX Dragon unmanned spacecraft successfully docked with the International Space Station today, Friday 25, 2012, setting a milestone never before realized in spaceflight. That milestone being that in a mere ten years, a private company began operations and developed a capsule and launch system that has now sent the same reverberations throughout the world as the beginning of the great space race between the United States and the Soviet Union. The race now, however, is different. This time the race is about free enterprise and while SpaceX is the early starter in this race there are others who are following behind. The other entrants in the new commercial space race include such notables as Orbital Sciences, Virgin Galactic, Sierra Nevada, Alliant Techsystems and Boeing, which through its various adopted companies, including the former McDonnell Douglas, has been a major player under the former paradigm of government sponsored spaceflight. The goal in this new environment is not geopolitical competition but rather free market competition. However, as this new era is thrust upon us, the issues of space policy and space law enter with them. The current regime of space law developed in the late 1960s to 1970s dealt with the paradigm of government sponsored spaceflight, but did not foresee the advent of commercial actors in the mix. The looming question is whether the first generation of international space law will be able to accommodate the paradigm of commercial space. If the first generation of space law is insufficient, can that deficiency be met with a new international treaty specifically addressing commercial spaceflight or will the laws of commercial spaceflight be made by a mix of domestic regulation and customary international law. Space policy of many nations will also be affected by the new era of commercial spaceflight. While the United States’ National Space Policy specifically includes commercial spaceflight, other space faring nations such as the Russian Federation and the People’s Republic of China have yet to fully absorb the impact that commercial spaceflight will have on their space programs and space policies. In particular, China will be most affected by this new paradigm. China’s space program is viewed internally as a tool for global competition with the United States for geopolitical prestige and influence. However, China’s space policies revolve around the paradigm of government sponsored spaceflight such that their program dovetails into the global competition with the United States. However, the advent of commercial spaceflight is a game-changing shift from that dynamic and leaves China with the question of how its government sponsored program can compete with a free market based program that commercial space offers. The question is whether China’s culture and internal dynamics allow them to shift their policy to compete directly with commercial space activities or will China will try to adapt its current paradigm to meet this new challenge. The Greek philosopher Heraclitus said ‘Nothing endures but change.’ Clearly, as we recognize and celebrate the advent of commercial spaceflight with the historic docking of the Dragon with ISS, this quote holds true. Throughout the history of spaceflight change has been small but incremental and those changes have slowly evolved spaceflight. However, in order to take giant leaps bigger changes are necessary and today’s historic docking is one of those big changes for the better that will not only shape our perceptions of the world today but for decades to come. Who is SpaceX’s customer? Who is paying the bill? What does any of this have to do with a free market? It’s just another form of privatization for the sake of increasing the already excessive fraction of national income funneled to the rich, which is the most basic source of the developed world’s current economic woes. But it is a beginning Mark.